Napoleon’s father was a strong supporter of the Corsican resistance leader, Pasquale Paoli. When Paoli fled the Corsica for his life, Carlo Buonaparte shifted his allegiance to the side of France. This move allowed him to enroll both of his sons, Joseph and Napoleon, in the French College d’Autun. After a few years at d’Autun, Napoleon gained admission to a military college in Brienne, which he attended for five years, after which he transferred to the military academy in Paris. Napoleon’s father died in 1785, prompting him to move back to Corsica to head his family. He graduated early from the aforementioned Parisian military academy, gained a commission as an artillery officer, and returned to Corsica in 1786. Following in his father’s footsteps, Napoleon lent his support to Pasquale Paoli, who had returned to Corsica to lead the Nationalists in a civil war. Napoleon and Pasquale were split over many topics, so much so that Napoleon withdrew his support from the Nationalists, and moved his family to France, where they adopted the French version of their name; Bonaparte. Napoleon’s return to France prompted a re-commissioning in the French military. He joined his military unit in Nice in June 1793, and threw his political support behind the Jacobins, a progressive and popular party after the French Revolution. The Jacobins came into dictatorial power for a short period that became known as the reign of terror. Fortunately for Napoleon, he fell out of favor with Jacobin leadership, letting him avoid execution, and fell into the good graces of the Government, which he defended from counter-revolutionary fighters in 1795. Because of this he was named commander of the Army of the Interior, and became a trusted military advisor to the Government. In 1796 the Army of Italy, then a client nation of France, was placed under the command of Napoleon. 30,000 malnourished men with low moral were whipped into shape by the young commander, and were led to victories against Austria. In the process, the Italian military greatly expanded the French border. On March 9, 1796, Napoleon married Josephine de Beauharnais, the widow of General Alexandre de Beauharnais, and who had two children of her own. Napoleon squelched a royalist threat in France, and was then deployed to the Middle East in 1798. This was part of an effort to limit British trade with the region. However, his campaign failed in spectacular fashion. As a result of their confidence in seeing France defeated, Austria, Britain, Turkey, and Russia formed a coalition against France. In 1799, the French were beaten in the Italian peninsula, and were required to surrender most of their territory there. Civil unrest persisted in France as well. In June of 1799, the Jacobins staged a coup and took control of the country. Napoleon returned in October of the same year, and schemed with a member of the new government to perform a second coup, this one placing him and two others in power. Napoleon’s coup was successful, and saw the adoption of a new constitution in 1800, and the creation of a position known as the first consul, which was effectively a dictatorship. This position had the authority to appoint generals, governors, civil servants, judges, and members of legislative bodies. Napoleon fulfilled the first incarnation of this position, and led economic, social, military, education, legal, and religious reforms, such as reinstituting Roman Catholicism as the state religion. He also oversaw the creation of what would come to be known as Napoleonic code, a set of laws forbidding privileges to be given based on birth, decreed government jobs must be granted to the qualified rather than used as favors, and mandated freedom of religion. Outside of French borders, he sued and achieved a brief period of European peace. Napoleon’s reforms proved incredibly popular, so much so that in 1802 an election was held and he was decreed first consul for the rest of his life, and in 1804 he was crowned emperor of France. The peace Napoleon achieved was short-lived. France and Britain again began warring again in 1803, and soon after that Austria and Russia returned to the fray. Napoleon originally had a plan to invade England, but due to a naval defeat he instead turned his wrath eastward. His victories in the east, defeating combined Austrian and Russian forces in Austerlitz, allowed him to install individuals loyal to him in positions of power in Naples, Sweden, Holland, Italy, Westphalia, and Spain. Napoleon’s marital status changed in 1810, when he had his marriage to Josephine annulled due to her inability to have a male child. He married the daughter of the emperor of Austria, Marie-Louise, that same year. She was 18 years old when they married. In 1811 they had a son, Napoleon II. The military invincibility of Napoleon would come to an end at this time. Several defeats destroyed the national budget of France, and a winter invasion of Russia in 1812, which began with over 600,000 men, left fewer than 10,000 in condition to fight. The defeat of Napoleon filled his enemies, foreign and domestic, with confidence. A coup was attempted, but failed, while Napoleon was fighting in Russia. At the same time, British forces were sweeping through French territories. With limited resources to resist, and with extreme tension from within and without his empire, Napoleon surrendered on March 30, 1814. He was then exiled from France to an island named Elba. Almost 1 year later, Napoleon escaped his place of exile and returned to Paris, where the people were overjoyed at his illustrious return. The honeymoon did not last long. Napoleon led his forces once more into battle, defeating a Prussian force in Belgium, only to be humiliated a few days later at Waterloo. The week after his defeat, he abdicated his title and powers. His request to have his son be named emperor was rejected by the coalition of nations aligned against him. After his second abdication, he was again sent into exile. This time he was placed on the island of St. Helena. Napoleon’s life quickly deteriorated into boredom. With minimal things interesting him outside of reading and writing, he eventually disconnected himself from the outside world. 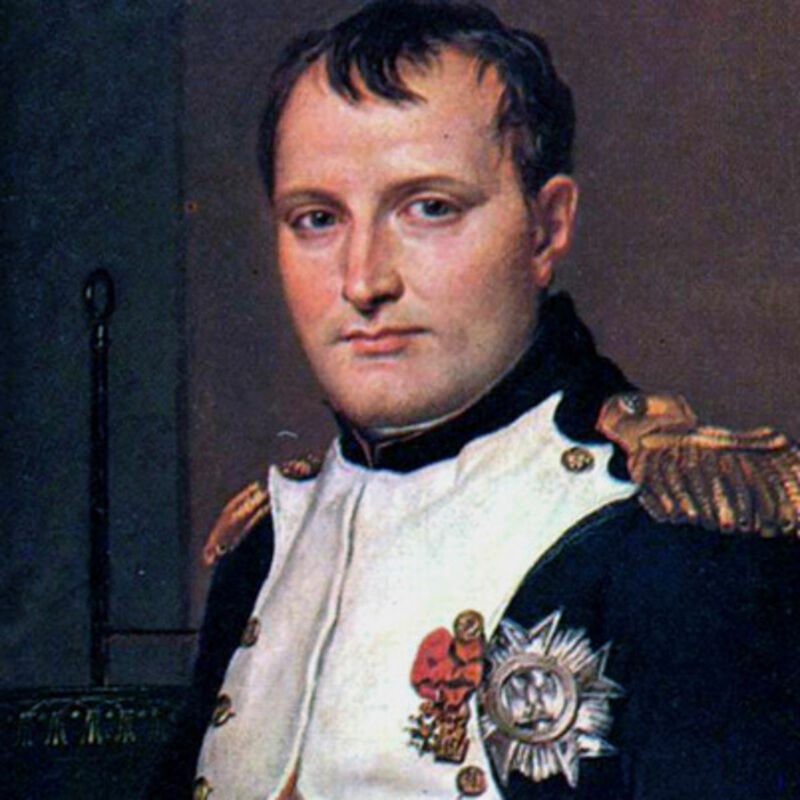 In 1817 likely due to a stomach ulcer or cancer, Napoleon’s health began to rapidly fail. By spring of 1821, he was confined to his bed, and wrote the last words of his will; "I wish my ashes to rest on the banks of the Seine, in the midst of that French people which I have loved so much. I die before my time, killed by the English oligarchy and its hired assassins." The once proud emperor died on the 5th of May, 1821.